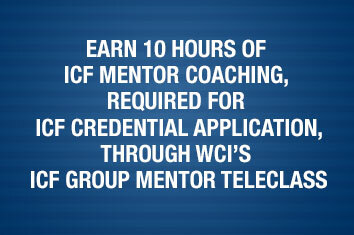 WCI’s ICF Group Mentor Coaching Teleclass is an advanced coach training option. This course is specifically for WCI coaches who are applying for an ICF Credential and interested in obtaining the required ten hours of ICF Mentor Coaching. Comprehensive five-week teleclass which includes: 1) ICF application insight and support 2) an advanced in-class coaching practicum 3) in-depth look at what will allow one to pass or not pass the credentialing application of their choice 4) and fulfillment of the required Individual ICF Mentoring Sessions. You must be enrolled in or you must have already enrolled in one of the following courses. Participate in and observe an in-depth study of coaching and the ICF Core Competencies. WCI coaches who wish to advance their coaching skills and apply for or renew an ICF credential. Deliver top notch masterful coaches ready for ICF credential application! Meet once per week for 5 weeks. Please see upcoming course start dates and times on the Enrollment Form. Then 45-minute individual sessions take place once each on the three Fridays (2pm - 7pm ET) and Saturdays (11am - 4pm ET) following the last class. You get to choose the time of your sessions! Class Project: Submit a recording coaching session (the one you are planning to send with your ICF application) for review by WCI's Training Director and your course Instructor. You will hold a Certificate of Completion for the ICF Group Mentor Coaching Teleclass. ©2006-2015 World Coach Institute Inc. All rights reserved.